Baltimore, Maryland is a culinary gem, offering a working class swagger with more great food and drink options than nearly any city in the country. 4lobe events Baltimore is a culinary focused event and team building company designed to work with both corporate and non corporate groups of all sizes to create exciting, creative culinary events. We will provide you and your group with high value, culinary events while working within your group size, timing, budget, and any other constraints where you can experience the unique culture of Baltimore and the surrounding areas through its food and drink. We offer customized culinary and non culinary focused events and team building activities for both corporate and non corporate groups. We run activities throughout Baltimore in the following neighborhoods: Fell's Point, Federal Hill, Littly Italy, Mount Vernon, Hampden, Station North, Downtown, the Inner Harbor, Towson, and surrounding areas throughout Maryland. We offer events focused on Baltimore's food, drink, and culture can provide individuals and groups with a lasting and unique experience. For instance, we offer interactive, multi station reception and event dinners and luncheons that highlight different parts of Baltimore. In one place, guests can food and drink from both little Italy and Greektown without having to visit each area. Our acclaimed events are developed specifically to create a memorable experience. 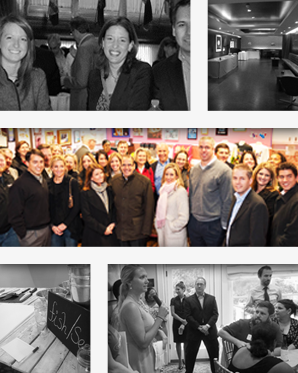 Our staff is ready to help create the ideal culinary event for your group. We have a catalogue for you to choose from of over 100 different events that have been enjoyed by thousands of clients. We can either run a previously created event, modify to meet your needs or develop something entirely different. 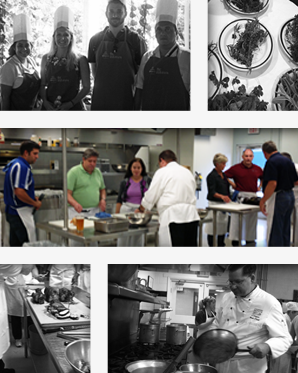 Culinary focused team building is a 'multi-tiered' approach to standard team building. Guests interact by eating, drinking, and depending on the team building activity, preparing items as well. Guests get to taste, smell, see much more than in a standard team building activity. Although the majority of our team building clients are corporate, we also offer them for wedding parties, birthdays, family reunions, or any type of get together. 4lobe events Baltimore works with Welcome DMC to provide destination management services that are culturally and culinary focused. As a boutique destination management firm, they are able to focus both on providing 'soup to nuts' services, but also highlight what Baltimore has to offer. Our signature series of events, the culinary challenge brings a hands on approach to team building combined with friendly competition. Guests are joined into groups, and are given roles in order to create one or several items (including a dish, a drink or series of dishes, etc) within an allotted timeframe. We utilize our mobile kitchen system to offer our culinary challenges in nearly any venue throughout Baltimore, both large and small. We work with charismatic, enthusiastic classically trained chefs from in and around Baltimore in order to provide you with a variety of cooking classes. With complete instructions, specially designed recipes, and hands on instruction, your team can work together and create dishes like a professional. Cooking classes are available for beginner, intermediate and expert chefs. The culinary scavenger hunt provides all the great elements of a traditional scavenger hunt while incorporating samples of food and drinks throughout one of Baltimore's iconic neighborhoods. Groups work together to solve puzzles, answer questions, sample drinks and food, and unlock the mysteries in one or several Baltimore neighborhoods. You will seek out neighborhood landmarks as well as landmark food and drink. For instance, you may have to photograph your group sampling a particular local beer, or find an authentic polish sausage smoked on site. Our highly trained guide will provide instruction and support whenever needed throughout the hunt. 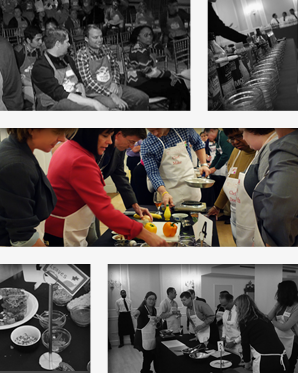 The culinary scavenger hunt is a budget friendly event and is available in Fell's Point, Little Italy/Jonestown, Mt. Vernon, Federal Hill, and Hampden. A progressive dinner can take place either by foot or by motorcoach/limo and can be either neighborhood or city based. We offer a number of Baltimore and non-Baltimore specific themes for progressive dinners depending on the interest and nature of the group. Enjoy walking or motorcoach based guided tours that combine history, culture, architecture and local food and drink into a three-hour option. 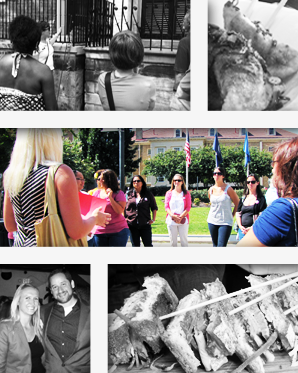 Team Building elements can be added to food tours, such as quizzes and groupwork if desired. 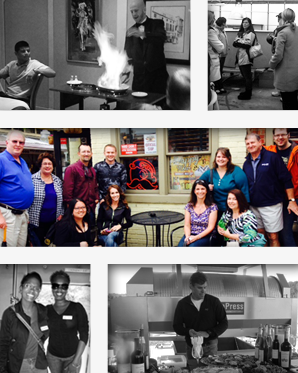 Food tours visit 4-5 establishments for specially created dishes (and drinks when applicable). Tasting tours visit 6-10 establishments for samples. Hybrid food tours are also available. A dine around is a customized, typically more formal food tour offering multiple courses at fewer restaurants. Dine Arounds are evening activities, but can be customized for budget, start time, alcoholic beverage pairings, themes, transportation, and more, while food tours do not change as much. 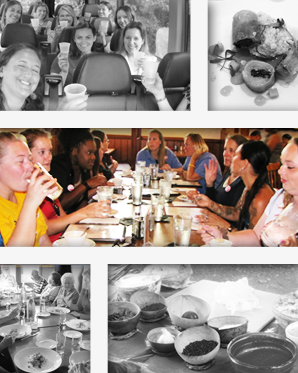 A single restaurant Dine Around can provide large groups, such as conventions, with the ability to enjoy a pre selected multi course meal at an acclaimed Baltimore restaurant. Guests will be able to choose from several entrees and appetizers. We provide or direct motorcoach transportation to the restaurant of choice for up to 1000 guests. Guests will choose their restaurant in advance. We work with dozens of estaurant partners throughout Baltimore, and offer numerous options at most price points to offer services from budget to VIP. Our Interactive reception series known as victuals brings the heart of selected Baltimore neighborhoods into nearly any venue. We utilize our extensive experience in both Food Tours and unique culinary events to create an unforgettable experience. By incorporating music, images, food, and drink two different stations we work to recreate a neighborhood such as Fells Point for a group that may not have time to enjoy the neighborhood itself. We work with restaurants to develop special dishes and drinks to follow a custom theme. Our food tour guides are stationed throughout to take your guests on a journey to each area and offer stories about each area. A Victuals main emcee helps to give individuals the route between 'neighborhoodsÕ. We work with sister company Charm City Food Tours to offer you a variety of tours and tour based events throughout Baltimore. Baltimore has a rich history spanning back nearly to the founding of our nation. As an important deepwater port, it brought commerce and items from throughout the world to the city. Resultantly, Baltimore has become the home for scores of immigrants from throughout the world, looking for jobs and a better life. The waves created various ethnic enclaves and helped define local Baltimore cuisine. Baltimore boasts a system of public markets located throughout the city, each with unique specialties, and a surprising variety of indigenous dishes and drinks. Explore eclectic neighborhoods including Fell's Point, Mt. Vernon and Little Italy, and fantastic restaurants run by a growing group of creative, innovative chefs. Architectural marvels stud the impressive skyline, and miles of historic rowhomes house a variety of residents. Enjoy the sights of the inner harbor and then escape to see an authentic unique city with a foodie centric vibe. Please contact us for more information regarding culinary events or other activities in Baltimore.